For years, local boosters have said that the Food and Drug Administration's new campus in White Oak would bring jobs and prosperity to East County as companies flocked to work with the government agency. Yet a new report commissioned by the Planning Department suggests that it'll take a lot more to revitalize the area. The Food and Drug Administration campus in White Oak while under construction. Photo by Evan Glass. Last year, county planners began work on the East County Science Center Master Plan, which will propose creating a new community for research and technology on some 1300 acres around the FDA campus on New Hampshire Avenue currently occupied by strip malls, office parks, and a few apartment complexes. Already, the area has drawn Washington Adventist Hospital, which would move from Takoma Park, and a proposed, county-funded business incubator. The Planning Department's brought on Partners for Economic Solutions, a Takoma, D.C.-based consulting firm, to produce this 55-page report (PDF!) detailing how much more development the Science Center could attract. "The scale of FDA's impact is much more modest than anticipated by some supporters," says the report, which cites "limited potential for life science business development" as a result of the FDA's relocation from Rockville, which will bring 9,000 workers to White Oak. The consultants say that the biotech and life sciences companies that planners want to bring to East County are drawn to the Great Seneca Science Corridor along I-270, where those kinds of businesses are already located. Map of major development sites within the East County Science Center. Landlords in White Oak have already reached out to biotech companies and received little interest about properties in the area, the consultants say, while a survey of 24 life science companies located along I-270 revealed that firms won't move to be closer to the FDA. Many said that being close to the FDA wasn't as valuable as being near other science and technology firms, which provide opportunities for collaboration with their peers. A quarter of the companies said proximity to the owners' houses was a factor in where their offices located. The InterCounty Connector will make it easier for biotech firms to take advantage of the I-270 corridor's amenities while still having easy access to the FDA, the study notes. "When coupled with the U.S. 29 corridor’s road congestion and limited transit service, the [East County Science Center] will have difficulty competing for life science companies in any significant number," concludes the report. Successful research parks also tend to be affiliated with universities, the consultants found, like the University of North Carolina and the Research Triangle, or Stanford University and the Stanford Research Park in California. Though the University of Maryland is only a few miles away from the East County Science Center, and part of the center was once the university's experimental farm, the school is likely to focus efforts on their own research park, located adjacent to their campus in College Park. The consultants recommended that the county seek a major research institution or university to anchor the East County Science Center, much as Johns Hopkins University and the Universities at Shady Grove already do at the Great Seneca Science Corridor. Yet the most significant recommendations made by Partners for Economic Solutions involve changing the East County Science Center from the spread-out office park it is today into a more well-rounded community. They say that massive investments in public transit, like the Bus Rapid Transit system currently being studied by the county, will be necessary to provide an alternative to the area's congested roads. The consultants also suggest that the East County Science Center incorporate some sort of walkable, mixed-use development, including housing, shops and restaurants, and hotels. 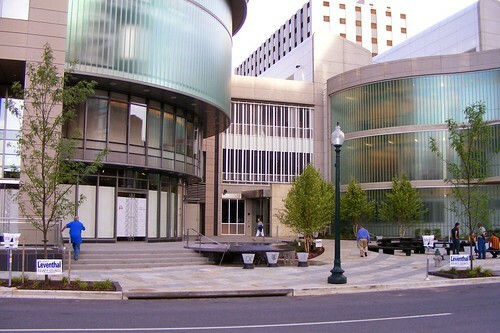 The new model for science development: United Therapeutics' headquarters is located in the middle of downtown Silver Spring. The first floor has shops and a public plaza. East County is "vulnerable to new and existing competition that offers a superior pedestrian experience," says the consultants. The new model for research parks looks like Cambridge, Massachusetts, home to Harvard and MIT, where scientists live, shop and hang out a few steps away from where they work. Johns Hopkins University, who's planning a mixed-use development in the Great Seneca Science Corridor, has compared their project to Harvard Square in Cambridge. Not only does this put East County in competition with other research centers, but with communities that already offer a walkable, urban environment, like downtown Silver Spring, where pharmaceutical company United Therapeutics is building their headquarters. The consultants propose creating a mixed-use community at the White Oak Shopping Center, noting that there's an untapped demand for high-end retail and a more attractive shopping environment in East County. However, the shopping center is successful enough now that any redevelopment would have to happen at much higher density to be economically feasible. Instead, the consultants recommend building at LifeSci Village, a complex of housing, offices, shops and a conference center proposed by local developer Percontee on the site of a concrete recycling plant next to the FDA campus. 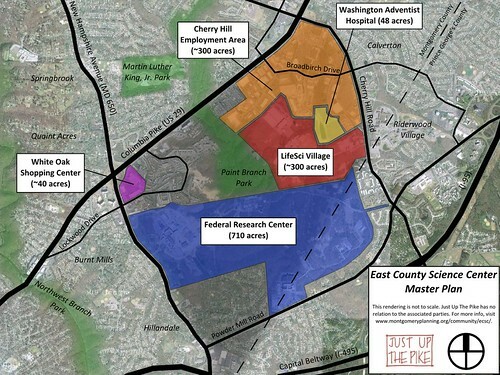 A development at either of these sites would not only would a science center with shops and housing give researchers a place to hang out, but it would serve East County as a whole, which lacks such a place today. 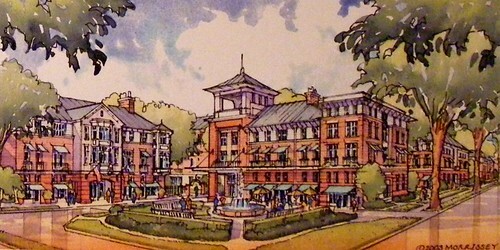 2006 rendering of LifeSci Village. For decades, East County's community leaders have sought to bring the kinds of jobs, retail and other amenities enjoyed by the more affluent west side of Montgomery County. Yet this report suggests that high-paying jobs aren't enough to create a better community. Ironically, the one thing that could truly make East County a better place to work is the one thing it's fought off for years, as community activists in different neighborhoods have opposed new sidewalks, new housing, improved retail, public spaces, improvements to local transit. Attempts to place shops and housing on the 710-acre FDA campus, which would've helped to create the kind of environment science and technology workers want, were shot down by neighbors fifteen years ago. The study by Partners for Economic Solutions confirms existing trends that say companies are less interested in suburban office parks, and if East County wants to draw those businesses, it should follow suit. So far, we've thought of the East County Science Center as a place to work. Yet the plan has even more potential if we consider it a place to live, shop, eat, and gather as well. After all, how can we cure cancer if our researchers are spend all their time in traffic driving to and from work? transit and community issues aside, any idea when or if biotech companies are going to take up residence and open labs there? months? years? For the life of me I don't understand why people block development that would make their lives easier. traffic is the main concern, but NIMBYs are willing to sacrifice increased property values, jobs, tax revenues, and a sense of place for the opportunity to hop into their cars and hit the beltway to shop and eat on the west side of the county.